"Brothers and sisters, we have a heaven-sent opportunity as an entire Church to demonstrate 'pure religion… undefiled before God' (James 1:27)—'to bear one another’s burdens, that they may be light' and to 'comfort those that stand in need of comfort' (Mosiah 18:8–9), to minister to the widows and the fatherless, the married and the single, the strong and the distraught, the downtrodden and the robust, the happy and the sad—in short, all of us, every one of us, because we all need to feel the warm hand of friendship and hear the firm declaration of faith. However, I warn you, a new name, new flexibility, and fewer reports won’t make an ounce of difference in our service unless we see this as an invitation to care for one another in a bold, new, holier way, as President Nelson has just said. As we lift our spiritual eyes toward living the law of love more universally, we pay tribute to the generations who have served that way for years." Elder Holland had the assignment in the recent general conference to speak, following President Nelson's announcement of changes to home and visiting teaching, and give elaboration and explanation about what that change meant. His remarks were wonderful and inspiring, helping to set the standard for a higher vision of what it means to minister to one another. As programs and practices change, and important key is the call for each of us to change and grow as well in both our vision or understanding, and in our actions of service and caring. The call to "love one another" has never been clearer, and has never been more crucial. 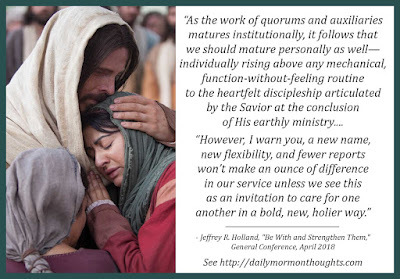 One thing that has not changed is the call to care for "all of us, every one of us, because we all need to feel the warm hand of friendship and hear the firm declaration of faith." 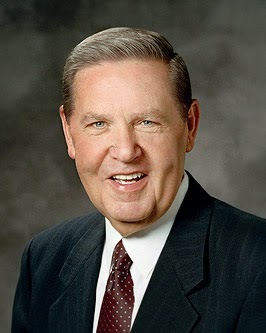 Elder Holland spoke beautifully about the power that comes as we truly care and service. With the vision of the Savior's call, and His example, firmly in our minds and hearts, we now have the opportunity to go forth and bless one another in wonderful ways!